Aidan Beatty is a historian from Ireland. His first book, Masculinity and Power in Irish Nationalism, 1884–1938, will be published next year by Palgrave-Macmillan. 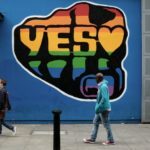 Marriage equality has finally come to Ireland. But what does the victory say about the state of the gay liberation movement?